Apple never takes part in Consumer Electronics Show. But TV manufacturers have partnered with the Cupertino giant to bring services such as iTunes content and support for AirPlay 2 to their panels. It's the time of the year again when the biggies, as well as startups, gear up for Consumer Electronics Show (CES) at Las Vegas to show the innovations and technologies they have been working on. Although, the event officially starts on January 8 (US time), here are some of the interesting announcements coming from the unofficial day 1 (namely press day) of the event. A year since the LG Display's 65-inch rollable TV prototype first appeared at CES, LG Electronics has now announced its flagship Signature OLED TV R rollable TV. Claiming to be a game-changer, the Signature OLED TV R can transform itself to offer three different viewing options-Full View, Line View and Zero View-allowing customers to use the TV in ways that were impossible before the development of OLED technology. The Full View will deliver a large-screen viewing experience revealing the full extent of the contrast, depth and realism. Line View allows the LG OLED TV R to be partially unrolled, allowing for management of specific tasks that do not require the full TV screen. In Line View, users can choose from features such as Clock, Frame, Mood, Music and Home Dashboard. In Zero view, all 65 inches of the LG OLED TV R is hidden from view, tucked away in the base. Even in Zero View, users will be able to listen to music and other audio content, which emanate from the 4.2-channel, 100W front-firing Dolby Atmos audio system. The rollable TV is powered by LG's second-generation a (Alpha) 9 intelligent processor and deep learning algorithm with support for Amazon Alexa, Apple AirPlay 2 and HomeKit. 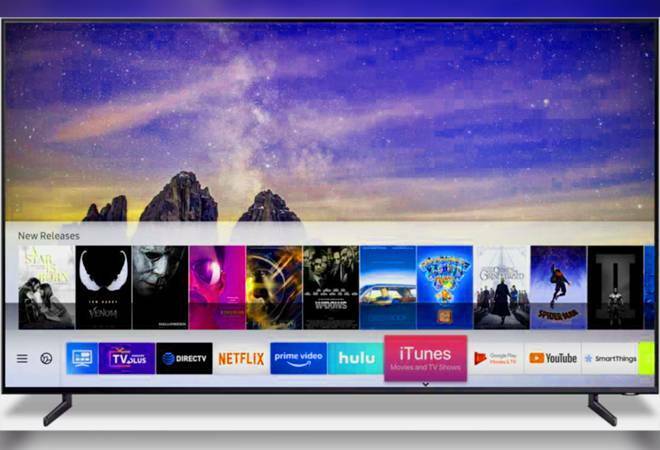 Although Samsung, too, took the wraps off its flagship smart TVs for 2019, it is the next generation Family Hub that caught our attention. With the new refrigerator, Samsung claims to have set a new standard for connected living, bringing the family together in the kitchen while freeing users up to focus on what's important to them. It features a new Family Board, a communal screen that family members can interact with in a personalised way. It is a sort of digital board where members can stick notes, photos and more. The Family Hub supports Bixby where users can ask Bixby for the morning brief to know their daily essentials such as news and weather update. The information asked appears on the Family Hub screen as well. And through Bixby's voice ID technology, each family member's voice is distinguished, so everyone can get tailored information for their individual needs. With Family Hub's integration of SmartThings, owners can now see and control hundreds of Samsung and third-party smart home devices right from the refrigerator screen and by voice with Bixby. The Family Hub enables a user to create better and healthier meals with Meal Planner, which customises recipes based on food preferences, dietary needs and the items in the fridge. The elegant looking smart ring by Motiv is now getting heart rate-sensing security feature that could be used for making payments, reports The Verge. This smart ring was capable of measuring heart rate for exercise and activity, but it will now be used for security verification. It will measure the heart accurately, and just like a fingerprint, verify users' identity. Once the identity is verified, the ring will be able to communicate with point-of-sale terminals to authorise payments. The functionality is expected to be added through a software update in the second half of 2019. Lenovo is focusing on refining ThinkPad X1 and has announced some new products including the ThinkPad X1 Carbon 7th Gen and ThinkPad X1 Yoga 4th Gen. Both the notebooks are thin and light. The X1 Carbon is an ultraportable computing machine featuring a 14-inch display is 14.95mm thin and weighs starting 1.08kg. It packs in a Dolby Atmos Speaker System, featuring two top-firing tweeters and two down-firing woofers, four far-field microphones, is powered by 8th Gen Intel Core processors and up to 15-hours backup time. The ThinkPad X1 Yoga, on the other hand, weighs 1.35kg and is 11 per cent thinner than the previous generation model at 15.2mm. It has a reinforced precision machined aluminium chassis in Iron Grey colour and supports all docking solutions, including ThinkPad Mechanical Dock. It even supports multi-mode pen input, has a premium keyboard, Dolby Atmos Speaker System, and an all-important battery life. With 5G rolling out this year, D-Link has announced DWR-2010 5G NR Enhanced Gateway that provides users with internet access with speeds 10 times faster than the current LTE standard. It provides 5G internet connectivity through an 802.11ac/n wireless network. The company claims that once connected, users can transfer data and stream media at speeds in the Gbps (gigabits per second) range, and a multi-Gigabit Ethernet port allows for super high-speed connections to wired devices. Support for D-Link's Wi-Fi Mesh technology makes it easy to add additional devices to create a mesh network covering large areas, and options of Zigbee, Z-Wave, and Bluetooth Low Energy (BLE) allow for the connection of a range of smart home and IoT devices.